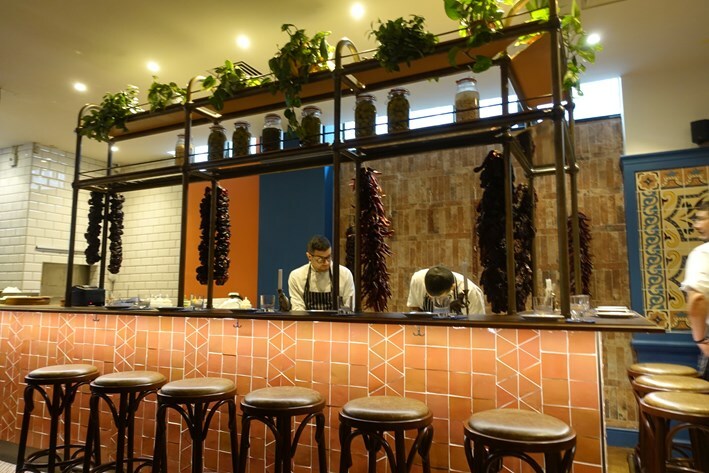 Barullo (meaning “hubbub”) is almost in the shadow of The Gherkin and is the latest restaurant of Victor Garvey, a Barcelona-born chef who runs Rambla in Soho, and previously ran the now shuttered Sibarita and Encant. 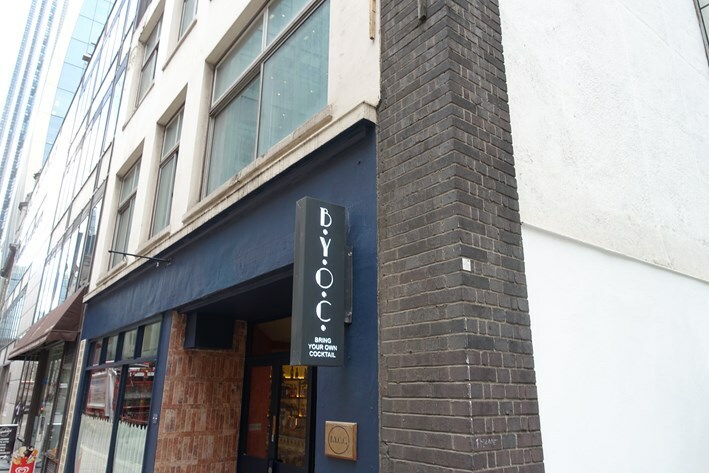 Mr Garvey was at one time head chef of Blakes Hotel, and has worked at various kitchens including a stint at Noma. Unlike many chefs who have done brief unpaid stages at Noma but still put it on their CV, Victor was a salaried chef there for over a year. 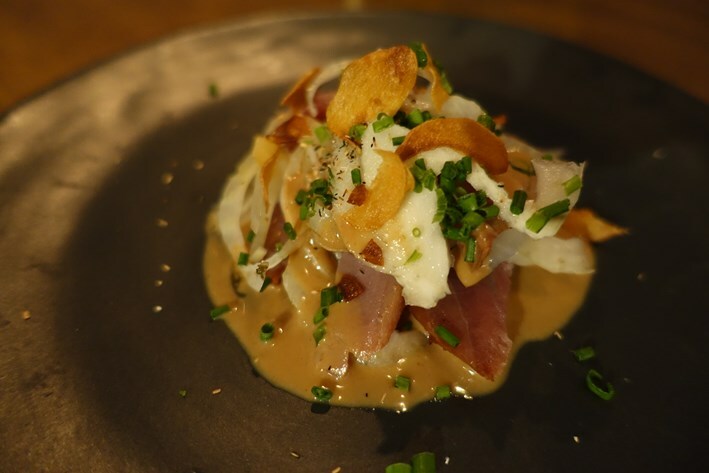 Barullo specialises in Spanish rice-based dishes like paella, as well as serving other crowd-pleasers like Iberico ham and croquettas. 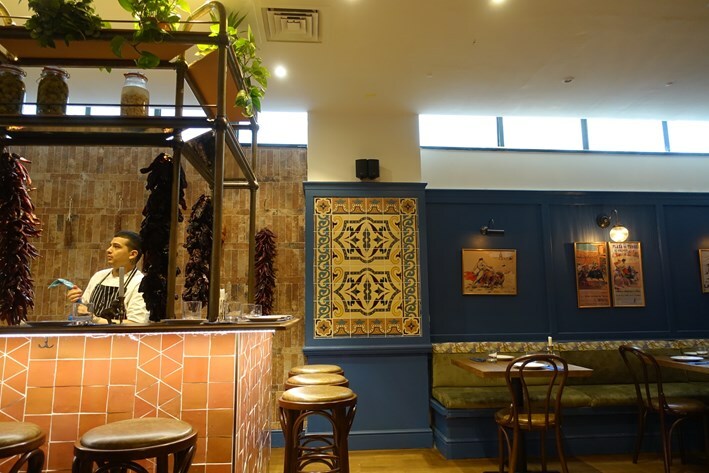 The ground floor dining room seats up to 64 diners at one time and the décor evokes that of Spain, with Spanish tiles and even gates from a Seville cathedral next to the kitchen. 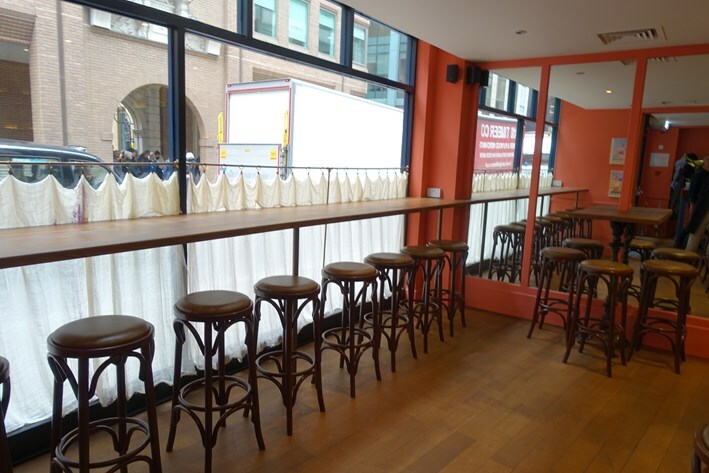 There is a separate bar area with additional seating. The lighting is disticntly on the low side but the room is attractively decorated, designed by a company called Lerose Design Studio. The wine list offered just 16 bottles, though it was nice to see seven sherries by the glass too. The list ranged in price from £25 to £60 with a median price of £36. Mark-ups were very high, an average of 4.5 times their retail price. Sample labels were Protos Roble 2016 at £36 for a bottle that you can find in the high street for £10, Domingo Martin Albarino 2017 at £49 compared to its retail price of £12, and Bhilar Plots Tinto 2017 at £60 for a wine will set you back £17 in a shop. 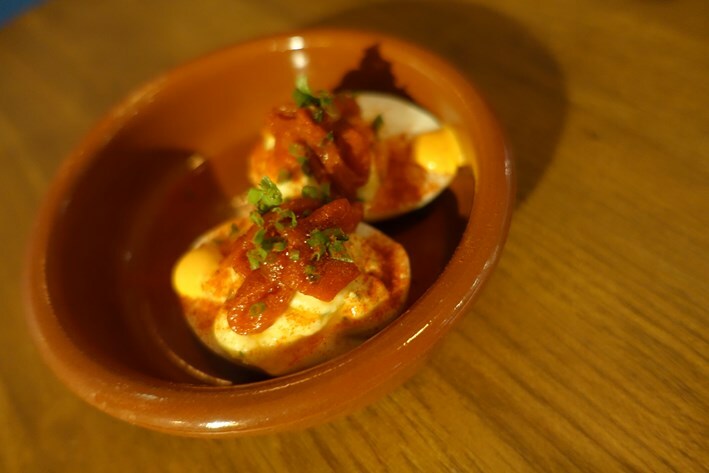 Devilled eggs with piquillo peppers were excellent, the mayonnaise good and the level of seasoning bold without being too strong (14/20). 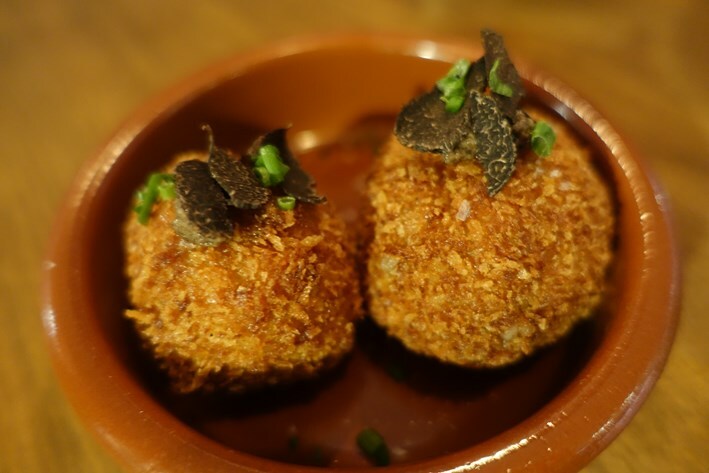 Croquettas had a filling of mixed wild mushrooms including porcini and black trumpet and were flavoured with truffle. It was good to see that this was real black truffle (tuber melanosporum) and not cheaper summer truffles, let alone “truffle oil”. The latter, incidentally, has nothing whatsoever to do with truffles, being an aromatic chemical called 2.4-dithiapentane, yet is often passed off in restaurants as “truffle” flavour. The croquettas had a pleasingly crisp coating and the mushrooms, scented with proper truffle, were a real taste of the woods. These were classy croquettas (easily 14/20). 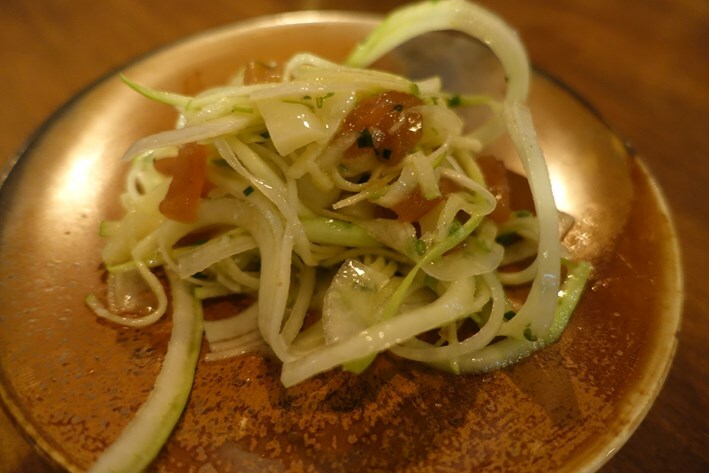 Salad of kohlrabi and green apple had a sharp dressing and was a good accompaniment to the richness of some of the other dishes. The salad also featured Garrotxa, a Catalan goat cheese, with the acidity of the apple cutting through the cheese very well (14/20). 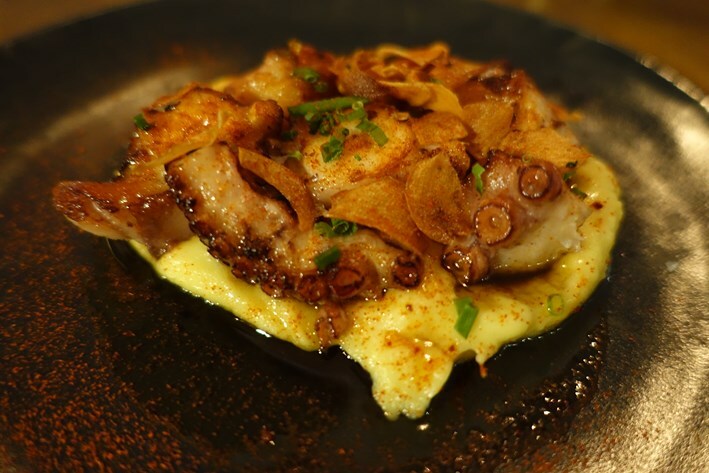 Octopus came with saffron potato mousseline and salsa Donostiarra. This is a warm dressing from San Sebastian involving garlic, lemon, olive oil and cayenne pepper. The octopus was quite tender and the mash was rich and buttery, but the salsa provided some much-needed balance to the richness (13/20). 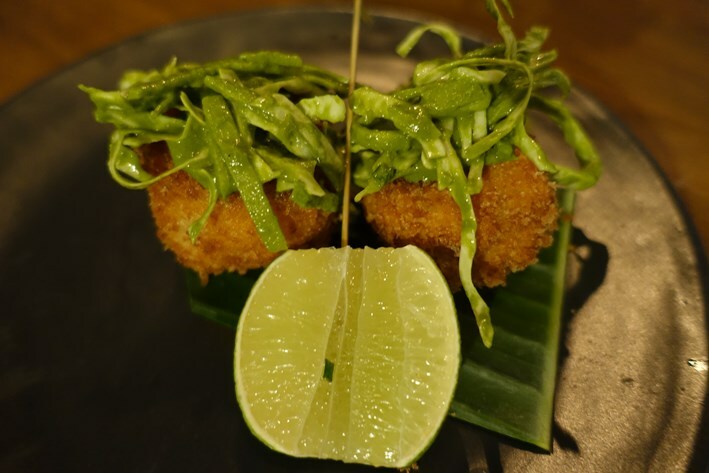 A pair of fritters with suckling pig and Saint Simeon cheese was good, the pork having good flavour and the coating being crisp. This was topped with a garnish of green apple, mild Napa cabbage (a type of cabbage from near Beijing rather than the Californian wine district) salsa verde and a slice of lime. The zing of the vinegar in the salsa verde and acidity of lime were a good balance for the richness of the pork (14/20). 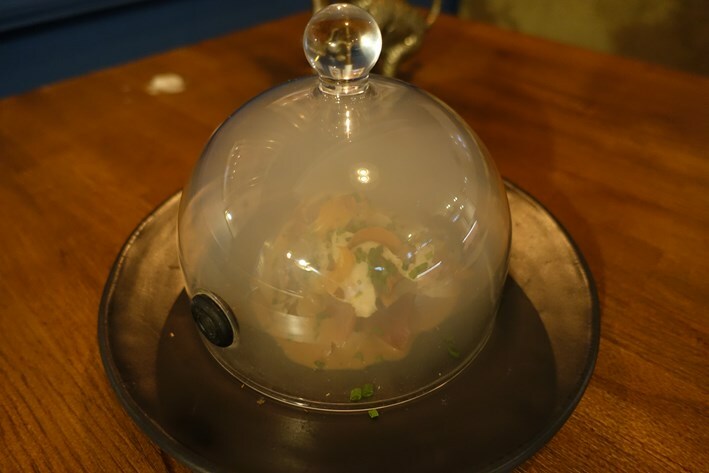 Smoked tuna was served under a dome to contain the smoke and then this was removed. The fish was a touch on the smoky side but I really liked the pine nuts and excellent pickled fennel with it (13/20). 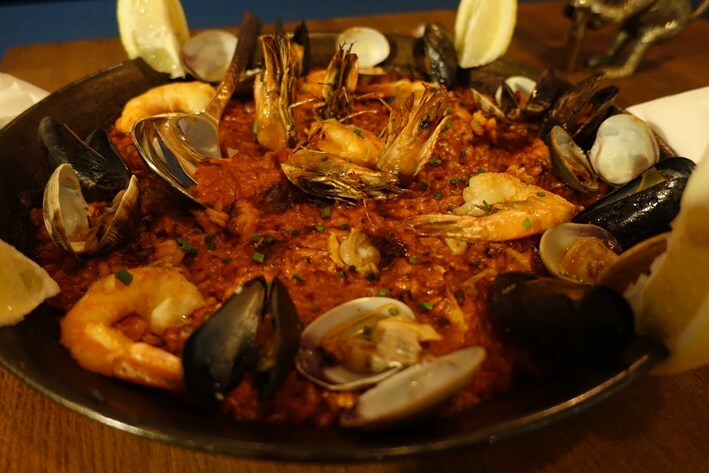 Seafood paella is designed here as a dish to share and was priced at £34, served in a cast iron pan with aioli on the side. The paella was made from Callasparra, a short-grain rice from Murcia, one of three in Spain to have a denominación de origen. The rice had good texture and was topped with monkfish, prawns, mussels, clams and squid. For me the stock (made with prawn shells and turbot bones) could have been somewhat deeper in flavour and the prawns were cooked slightly longer than I would have preferred, but the other seafood was good (13/20). My meal finished with Crema Catalana, a Spanish version of crème brûlée. 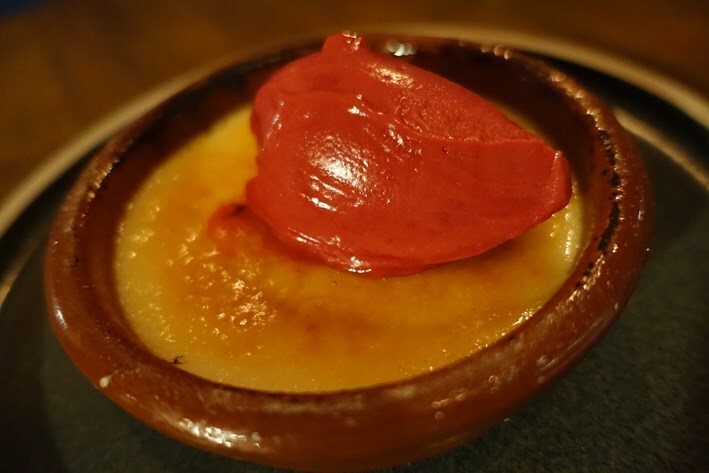 Doubtless the Spanish reckon that crème brûlée is a French version of Crema Catalana, and there is even a British claim to have invented the dish. However the first known reference to the dish in print is from a 1691 in a French cookbook from a chef at the Palace of Versailles. This version was very enjoyable, with a crisp top and good custard, topped with excellent raspberry sorbet (easily 14/20). Service was friendly and the bill was £66 with still water to drink, though that involved ordering an excessive amount of food. If you ordered sensibly and shared a modest bottle of wine then a typical cost per person might come to around £50. The restaurant had only been open for five days and didn’t even have its sign up outside the door yet, but this weekday lunch service was already packed, and my table was turned as soon as I finished my meal. This bodes very well for its future. 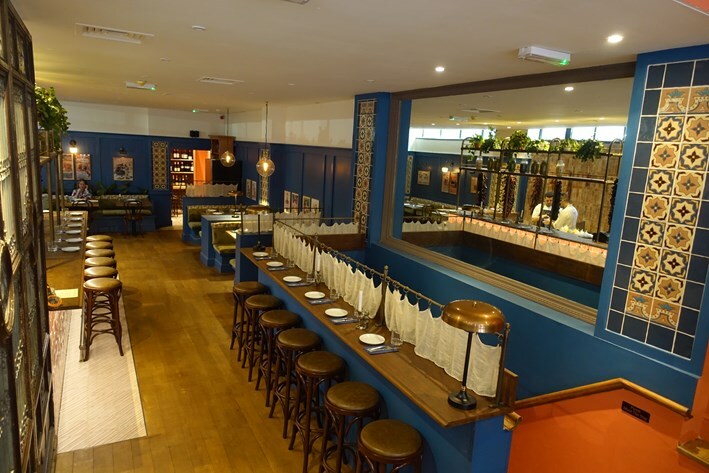 This was very early days for Barullo but it has an appealing menu and some nicely cooked dishes using better quality ingredients than many tapas restaurants in London. What an entertaining review! I did enojoy the discussion of aromates and on the origin of crêmes very much. Besides, your review put Barullo on my list for a decent place for dinner for my next trip to London!